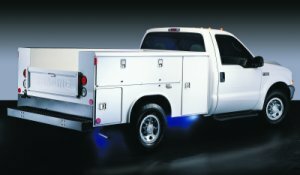 Batterson Truck Equipment is a one stop shop for all your commercial vehicle needs. We offer a variety of options for our customers including new installations, repairs, service, and refurbishments of used equipment. Our services include work on custom fabricated BTE beds and pre-manufactured equipment; such as Reading service bodies, Freedom flatbeds and gooseneck beds, Reading dump bodies, Freedom landscape bodies, Dutec crane bodies, Maxon and Tommy Gate lift gates, Weatherguard van equipment, and customer designed truck beds. We also carry a full line of accessories for your commercial vehicle including truck-mounted Liftmoore and Venturo cranes, Miller welders and air compressors, Ecco safety lighting and alarms, Weatherguard tool boxes, and storage equipment. We also specialize in sales and installation of Traffix brand Scorpion Truck Mounted Attenuators. As a premier upfitter in Houston, Texas we take pride in the services we provide and look forward to serving you! With our ever growing presents in the truck equipment business you can feel confident in your choice of Batterson Truck Equipment to handle all of your truck equipment needs. We know without YOU, there would be no US.